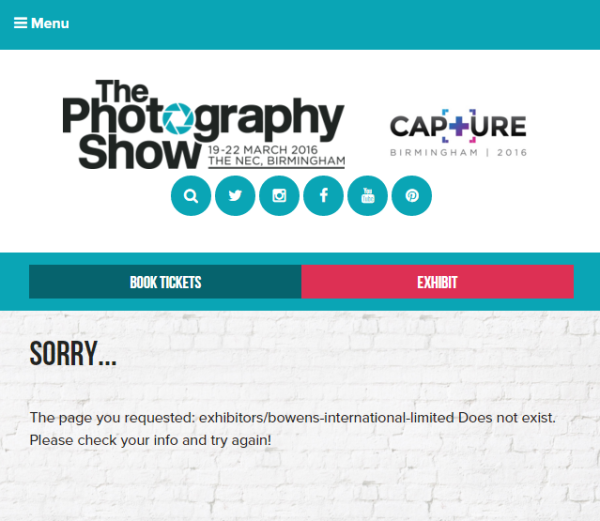 Bowens has reportedly withdrawn its exhibition at the The Photography Show next month. Update 22-02-2016: The company has issued a statement explaining that a flagship new product line will not be ready in time for the show, hence they decided not to appear at all. Bowens, the UK-based studio lighting manufacturer, has reportedly cancelled its exhibition at The Photography Show next month. According to DIY Photography, there will no longer be a Bowens stand, nor any studio lighting demonstrations on stage. The company were due to host a large stall on the show floor, a “studio & technique” stage and were the main sponsor of the Bowens Lounge area at the show. A “verified source” says there will be “no presence whatsoever” of Bowens at The Photography Show photographic trade fair — the UK’s largest — running from 19 to 22 March at the National Exhibition Centre in Birmingham. The exhibitor listing page for Bowens has been removed from the show web site. No reason has yet been announced for the move, which appears to have been at very short notice. Late last year, Bowens issued a press release heralding “exciting products” and expanded R&D for 2016, under new managing director John Gobbi.